“There are three ways of influencing a person: blackmail, vodka, or the threat of murder.” This view, attributed here to Vladimir Putin, casts a penumbra over the entire book. Still another way to achieve influence is to become someone’s creditor—shifting funds into their bank or real estate projects. If the transfer is done skillfully, it can help each side—launder the creditor’s ill-begotten income and save the debtor from bankruptcy. Putin and his entourage have become masters in all these tools of influence; Donald J. Trump, a beneficiary or victim, depending on one’s orientation. Since the 1990s Trump became deeply tied to Russian money and Russia mafia. One investigator of these links was Glenn Simpson, a former Wall Street Journal reporter and founder of private investigative agency Fusion GPS, who testified to several Congressional committees in 2017. 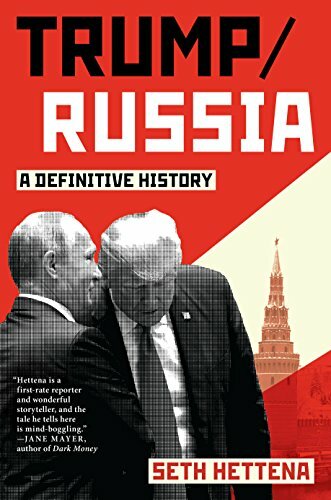 He said that “most of the people around Trump had a connection to Russian organized crime or Russia in one way or another.” It seemed “as if all criminal roads led o Trump Tower.” As the Spanish anti-corruption prosecutor José Grinda put it, Putin’s Russia was a virtual “Mafia state.” In Russia one could not tell the difference between the activities of the government and those of its organized-crime groups. Hettena’s book is remarkably up to date. It includes Special Counsel Robert Mueller’s indictment of 13 Russian hackers in February 2018 and Trump’s assertion that the FBI missed the many signals put out by the Stoneman Douglas Florida high school shooter, because it was spending too much time trying to prove non-existent Russian collusion with the Trump campaign. This quite readable spy thriller is deeply researched—12 to 53 citations for the introduction and each of 12 chapters. Hettena has tapped most if not all the relevant books, magazine and newspaper articles plus CNN and National Public Radio reports; court documents such as the February 2018 indictment U.S. vs Internet Research Agency LLC; UK archives on the Litvinenko affair; Facebook stories; the 2011 Deposition of Donald J. Trump in Trilogy Partners v. SBC Associates in a Florida District Court; not to mention tweets from the Trump White House. There is just one Russian language source (perhaps translated), but those statements generated by the Kremlin on these topics could hardly be very enlightening. Pending completion of the Mueller investigations and those by New York prosecutors, Trump/Russia will be nearly the last word on the subject. To see the larger context, one should consult Timothy Snyder’s Road to Unfreedom: Russia, Europe, America, reviewed here at NYJB.